RAFT RIVER, Idaho -- Nine irrigators who draw from the declining Raft River aquifer have proposed building an 11-mile pipeline, planning to switch fields to surface water when it's available for lease and to conduct managed aquifer recharge during the off-season. The groundwater area, called Basin 43, stretches from Idaho's border with Utah north to the Snake River Plain. Though the basin's irrigators haven't been included in the recent Surface Water Coalition call against junior Eastern Snake Plain Aquifer well users, the Idaho Department of Water Resources has warned they'll also have to make future changes to make their operations more sustainable. The project would cost $15 million to $18 million, and the farmers -- who represent 30,000 irrigated acres -- hope at least half of the project's cost will be covered by grants. They're in the process of applying for assistance from IDWR and the USDA's Natural Resources Conservation Service. Participant John Spratling believes the project would boost the local economy by keeping farm acres in production. "That's exactly why we want to do this, so we can keep farming," Spratling said. "I've got grandsons and two boys who want to farm, and that's what I did all my life." If the pipeline were to run at capacity throughout the entire irrigation season, an engineering study the growers commissioned estimates they could supplant 25,000 acre-feet of groundwater with surface water, known as a soft conversion. In a best-case scenario, the pipeline would enable them to inject another 19,000 to 20,000 acre-feet into the aquifer through winter recharge. "We have been talking about it for a lot of years, and just recently, it's started to look like something that could actually happen," said Todd Webb, a participant who serves on the board of the Raft River Groundwater District. "It's a very costly project to those involved, but ultimately, our goal is to maintain our livelihoods in that valley for a lot of years to come." The pipeline would divert water from the Snake River at the east end of Minidoka Reservoir and continue south along the channel of the Raft River, most of which has run dry in recent years. 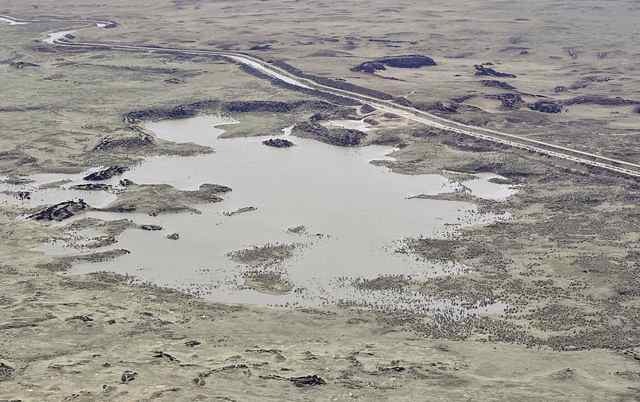 Recharge water would flood the river plain where the pipeline dead-ends and flow north in the river channel, filing nine planned recharge ponds covering 277 combined acres along the way. Project participant Kendall Jones said flooding the valley would restore riparian habitat, potentially bringing pheasants back to the area. He's met with the Idaho Department of Fish and Game to discuss the ecological benefits. Growers have also sought help from Rep. Mike Simpson, R-Idaho, and Idaho House Speaker Scott Bedke, R-Oakley. Participant Todd Garrett said leasing surface water would add at least $20 per acre to his costs, but the engineering study confirms the combination of recharge and soft conversion would more than offset the aquifer's declines. Garrett said the group is applying for a private recharge water right and could also recharge water from a state water right. IDWR's recharge coordinator Wesley Hipke, said recharge water would be available for the project in about half of years, given that a hydro-power project downstream on Milner Dam would have priority during the off-season. "If we can assist them, it's something the (Idaho Water Board) is definitely very interested in doing," Hipke said.